Fresh for spring! 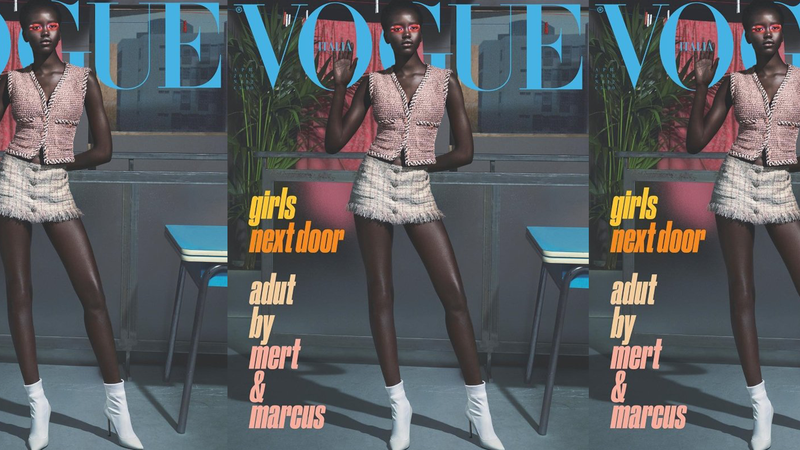 Adut Akech is one of the supermodels on the cover of Italian Vogue’s April “Girls Next Door” issue, shot by the photographer team Mert Atlas and Marcus Piggott. Barely 10 days after Akech’s star turn on the cover of British Vogue, here she is again, letting us know that she’s playing by her own rules with her brand of game-changing beauty. Dressed in a barely there Chanel miniskirt and crop top, with legs seemingly stretching up to the stratosphere from a pair of white Beatle boots, Akech is the girl next door in the mythical land of fashion where all fashionistas go out to play. She is stunning on the front cover of the three-paneled foldout featuring tomorrow’s superstar models Amandine and Bridgit Kos. Naomi Campbell gave her the best life advice, few words that guide her every day: “Always be true to yourself,” Naomi told her. So Adut today goes from one job and photo shoot to the next with that same sweet smile. While this 18-year-old—who’s from Australia, where she resettled at the age of 6 after leaving a Sudanese refugee camp in Kenya, and got into the modeling business only two short years ago—may be giving us the glamazon glare in her photo shoots, she’s just playing. Her real persona is all love and light. Get to know this stunning young lady in Italian Vogue’s behind-the scenes video. She’s got a spectacular head on her shoulders in every way—from her gorgeous features to her thoughts on what matters most in life. I guarantee her fabulous attitude will put a sweet smile on your face, just like the one she wears wherever she goes.